Following a single company of riflemen and machine gunners as they fight the first battle of the war against a vast German army, a battle which delivers the first four Victoria Crosses of the war. 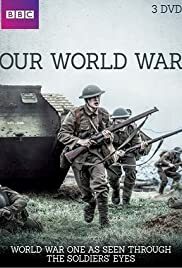 A soldier in the Manchester Pals regiment finds himself fighting both the Germans and a system that requires him to execute one of his pals. Make decisions for a young Corporal - Arthur Foulkes - as he leads a section of men during the attack on High Wood in 1916. The history of World War I as depicted with archival and modern aerial footage. Reading some of the previous reviews I feel them to unjustly pick on the music used. I thought it helped and gives the right emotional tone. Its modern yes... so is the audience. Using the music from back then might be awkward. Be it the music or the camera work... the program gives a fresh view of WW I and of the people who fought it. You feel like you are in the trenches waiting for battle. The actors look very much like the men they portray. I am very glad this is now available in Netflix and I sure hope to see a 2nd season. If you haven't seen it do so... this is some very very good directing and filming.